I've always given handcrafted gifts to family members for their birthdays and Christmas. This year, thanks to the homestead, I haven't been able to make the knitted, woven, embroidered, or sewn gifts I usually do. 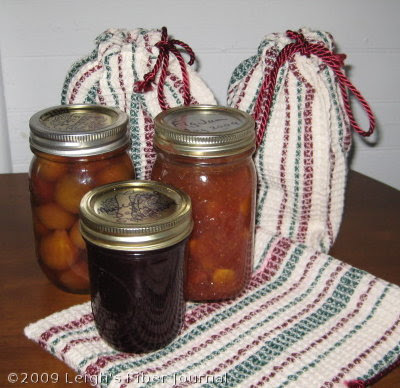 Instead, I decided to give some of fig jam, muscadine jelly, and canned figs I made this summer from our harvest bounty. Even so, it didn't seem like enough. I wanted a personal, finishing touch that would make it even more special. The answer? Some little bags made from handwoven samples. 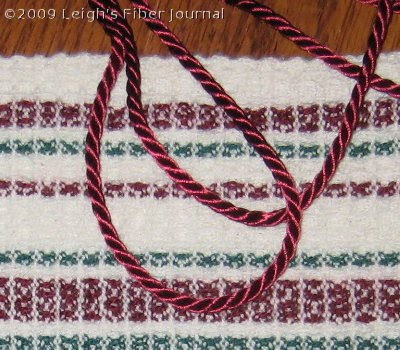 These were made from the waffle weave sampler I wove in July 2008 (all those samples come in good for something :) Not only was it the right size, but it's also in Christmas colors! 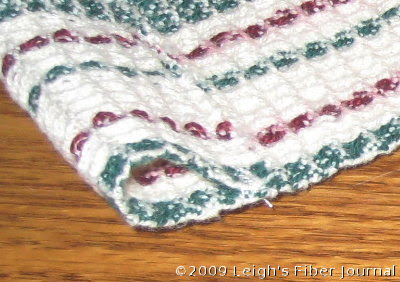 The sampler was 7.5 inches wide and quite long. I cut 20 inch lengths for the bags. I purchased cording for the bag ties. I folded them over one inch at each end. Then I seamed the sides, with the selvedges on the outside of the bag. The selvedges made a nice finished side to the bag with no turning and no bottom corners to neaten. I only sewed the side seams up to where I sewed the fold. Unfortunately the photo showing this didn't turn out. I think they made a perfect wrapping for my gifts. Plus, once the goodies are gone, recipients will have the bag forever. That is a great use for sample bits. They turned out beautifully and are a perfect compliment for the goodies. I think they made perfect gift warpping for you gifts too - and the perfect color! Great idea! 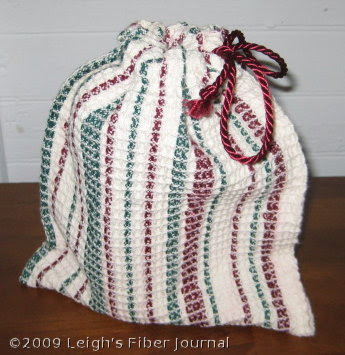 I have a cloth gift bag that some one gave me something in years ago. 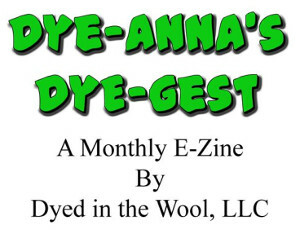 I still use it - and it's not from handwoven fabric. I love that your sample happened to be in the perfect colors for this year's gifts!!! Priceless! They look wonderful and festive. I'm sure everyone will be delighted. I know I would. What a great gift, the bags are priceless! And I like to give edible gifts, they get used up, and don't get dusty in some cupboard. What a great gift idea!!!! I'm sure everyone receiving one will love it. The bags are great I really like them. Great bags! Love the idea! and the jams look delish! What lovely gifts, and how well organised you are to have time to do this properly. Maybe next year I'll get the timing right and finish everything before Christmas. The lovely bags remind me of the Japanese tradition of wrapping presents in a special cloth, that is re-used time and time over. I don't like our wasteful western paper-wrapping habit. Well, if I got canned anything that would put me in heaven, but wrapped in a handwoven bag! I'd be speechless and touched that I was thought of and loved with such care. Lucky giftees! Great idea! ANd lucky choice of colours all those months ago! What a great idea, Leigh! So very fitting and gives a great finishing touch to your homemade goodies. You are the Oh-Wise-and-Great-All-Knowing-and-Powerful Ahhhhhhssss!